Hey folks, this is Frederik Drejfald at Affiliate Expert Academy, and NAM Offers, the premier affiliate network. Today I want to help you solve a problem I have seen my clients struggle with many times, How to find perfect customers online? If you don’t know how to, you are definitely going to lose good leads, and sales, when running your advertising campaigns. Market research focuses your business on your customers. Remember your customer is what drives and directs your business. Take every opportunity to listen and communicate with your customer through market research. When you truly understand your customers’ needs and wants you can’t fail. Market research keeps you focused. When you understand what’s most important to your customers you can organize your time more efficiently by prioritizing answering your customers’ needs. It helps you to recognize the best ways to make money online. Good research allows you to calculate which opportunities are more likely to earn the highest revenue. Market research keeps you in touch with the present market and focused on the future. Adapt or Perish! As the owner of a product regular research guides you and helps you to constantly adapt and evolve your brand to meet customers’ needs. In Affiliate Marketing good market research helps you to choose the best brands to promote. It improves your ability to make decisions and reduces business risks. 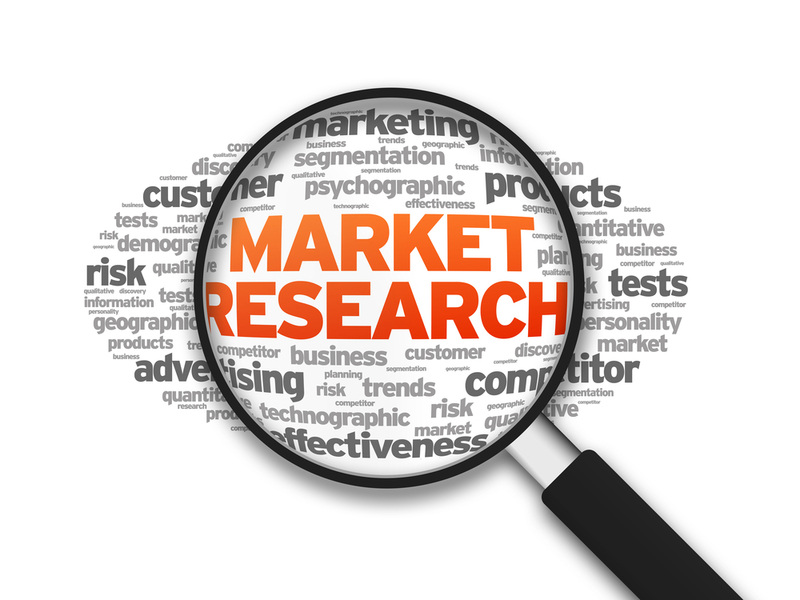 Proper market research provides invaluable information and data about your market, product, customers, competitors, and more. This information allows you to make the best decisions for your business confidently and minimizes your risk of failure. OK, now that we have a clear understanding of why market research is critical to any business, including affiliate marketing, let’s focus on finding your perfect customer. A quick tactic to find a lot of websites, all containing your perfect customer. Before you promote a product online you need to identify your perfect avatar (composite of the ideal customer). You need to know where your perfect avatar is located online, where they are hanging out and which websites they most visit. At this point you might be thinking, ‘Let’s start with Facebook’. Yes, Facebook is very useful and does offer a lot of cool tools, but there is so much more than just Facebook. Let me offer you a way to identify multiple websites, very quickly, all containing your business avatar, i.e. the audience you are looking for. First, I will use the example of a business that has been very good to me – Auto Insurance, and a website called Alexa (http://www.alexa.com/), that supplies web traffic data. Alexa provides extensive information and data on a company’s customers, and the visitors to their website. If you decide to use Alexa you will have to pay, but further below I will show you a similar website, which is totally free. Go to Alexa.com and enter Insure.com in their search engine. 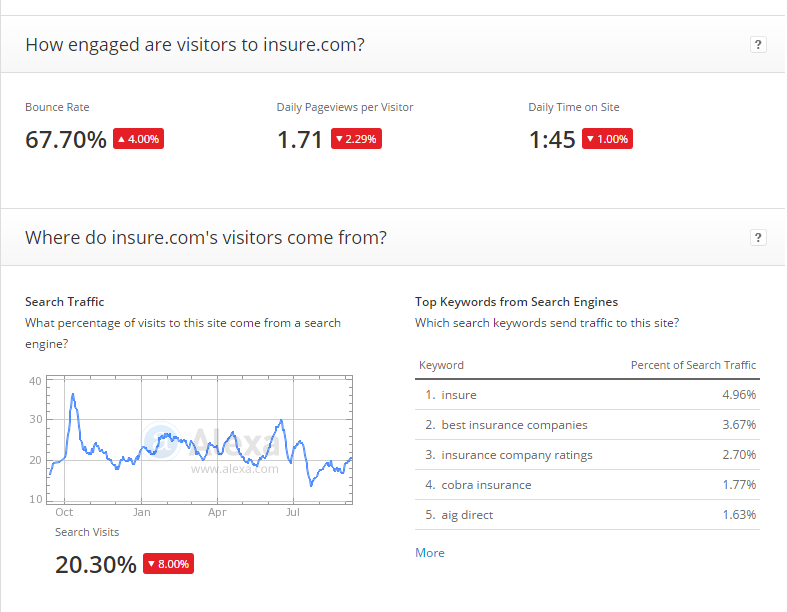 Now you can view a brief overview of Insure.com’s customer demographic. Alexa provides data on website visitors’ gender, age, browsing location, education, ethnicity, income and family status. This information is invaluable when it comes to setting up your advertising campaign. By knowing who your ideal customer is you will know which market to focus your advertising campaigns on. g.) Finally, you can see that the majority are either African-American or Caucasian. Sign up to Quantcast for free and create your profile. Type Insure.com in the search bar. 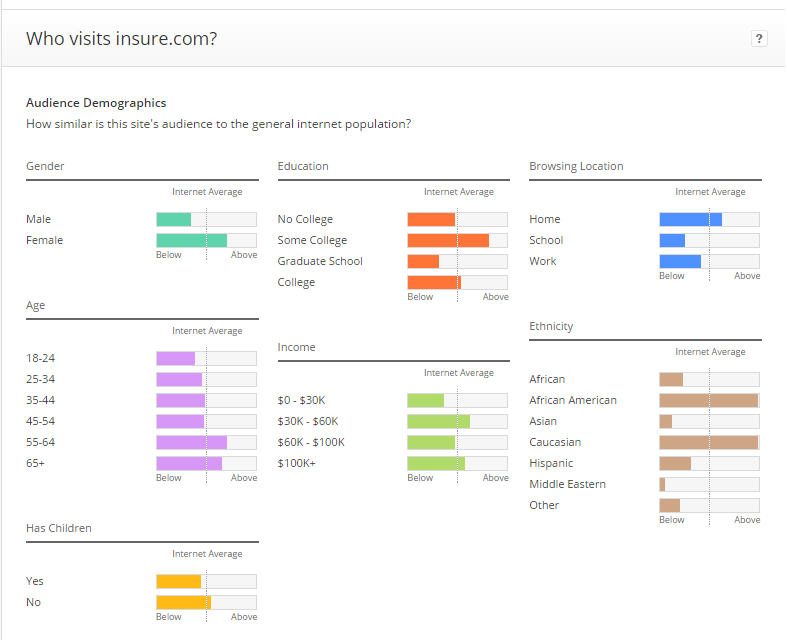 What is really great about this data analysis website is their tool called the Quantcast Media Planner. As well as the most accurate website traffic data analysis available, the Quantcast Media Planner performs very sophisticated audience searches. These searches are conducted against demographic attributes such as age, gender and income. They can also be conducted against audience interest affinities, such as Technology, Bridal, Gaming or Travel. Now you have access to Quantcast’s data on over one quarter of a billion (250,000,000+) internet users!!! This is the important part! Using the data you have gathered from Alexa.com about your ideal customer you can now enter the following data in the Audience Definition section of the Planner. Female, older generation (55-64), some college, no children, and browsing outside of their home. Now you can go to the Filters section and specify your ideal audience by categories. Folks this is awesome! You can target your ideal audience based on their personal interests, such as politics, gaming, food, etc. In the Filters section you can select websites with a minimum audience of anywhere from 500 to 10 million viewers. 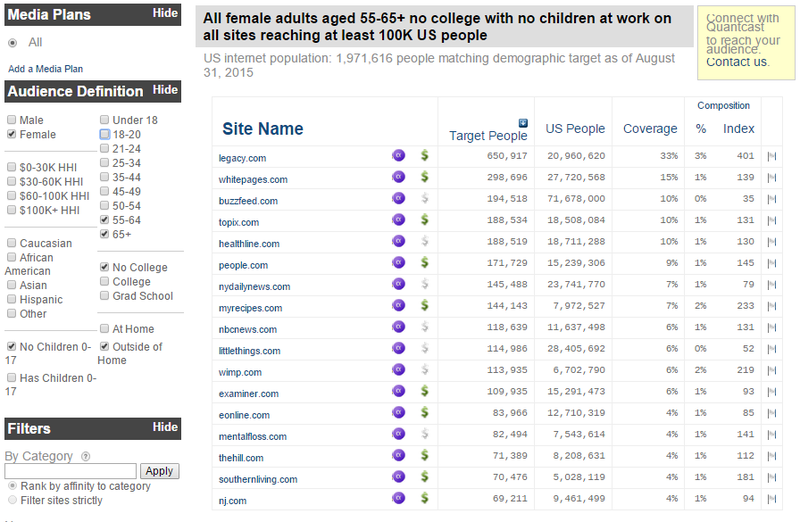 In the above image you can see a list of seventeen websites which are visited by the ‘older generation, female, some college and no children‘ demographic. Under Target People you can see the number of your ideal customers visiting each site. It’s a good idea to copy and paste this list, and to use it for further research. Now you can dig deeper into your search for ideal customers. Google a website called SimilarSites (www.similarsites.com). Enter one of the websites from your new list (of seventeen websites) into the search bar at SimilarSites. 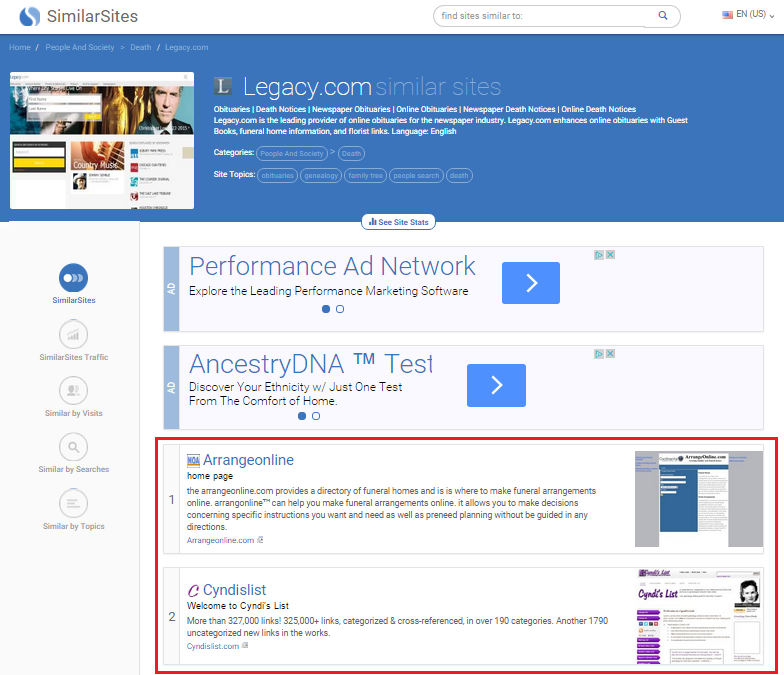 In this example we will search for similar sites to Legacy.com which is the first site on our list. You can assume that a lot of the visitors to the similar websites are similar to your ideal customers. These leads can result in a lot of sales! But don’t stop there. Keep digging. Find out if these websites are being promoted on Google. What keywords are they using? Can you use those keywords to create successful ads? You can even go ahead and start bidding on those websites’ specific URLs. If you’re running PPV, or PPC aswell, you can do some research on Facebook. Find out if the websites have any Facebook fan pages. Then check if the fans on those pages are similar to your perfect customer. OK folks, I hope you see the potential here! By using Alexa, Quantcast Media Planner, SimilarSites, Google, Facebook, and some intuitive reasoning, you can access every marketers’ dream, a long list of ideal customers! With practice you can create the list before you finish drinking a cup of coffee. Seriously. All the best, and feel free to join our expert team!